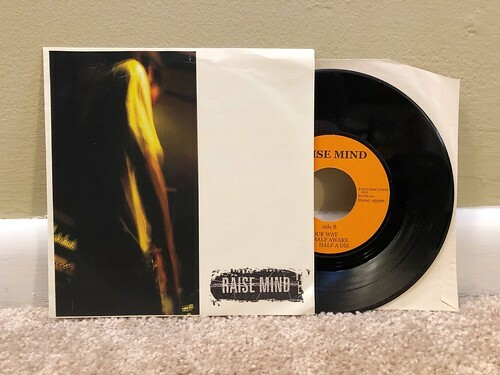 I Buy Way Too Many Records Dot Com: Raise Mind - Farewell 7"
This Raisemind 7" is another record that I grabbed while I was record shopping in Tokyo a couple of years ago. I was especially excited to stumble across this 7" as I've had Raisemind's full length album since it came out back in the early 2000s. I didn't know that the band had released anything else, but I came across this 7" along with a CD EP while in Japan. According to Discogs, there is also a split CD that I don't have. Hopefully I can track that down at some point to complete the collection. This 7" is great, just like everything else I have by Raise Mind. They play the sort of fast, melodic punk rock that would be right at home on Snuffy Smiles in the late 90s. That's some of my favorite kind of music in the world. Raise Mind are right up there with some of the other bands of the era like Just One Day or 8Roof. Two of the four songs on this 7" also appeared on the album Back Number. Of the other two, "Half A Wake, Half A Die" looks like it was also on that aforementioned split CD that I don't have, but the opening track "Farewell" seems to be exclusive to this 7" as far as I can tell. Even if all of the songs had appeared elsewhere, I still would have bought this to have them on vinyl.